It was recently revealed that the physical version of Spyro Reignited Trilogy will only include one retail disc for the first game, Spyro the Dragon. Meanwhile, the other two games (Spyro 2: Ripto’s Rage and Spyro: Year of the Dragon) will be included as digital downloads. 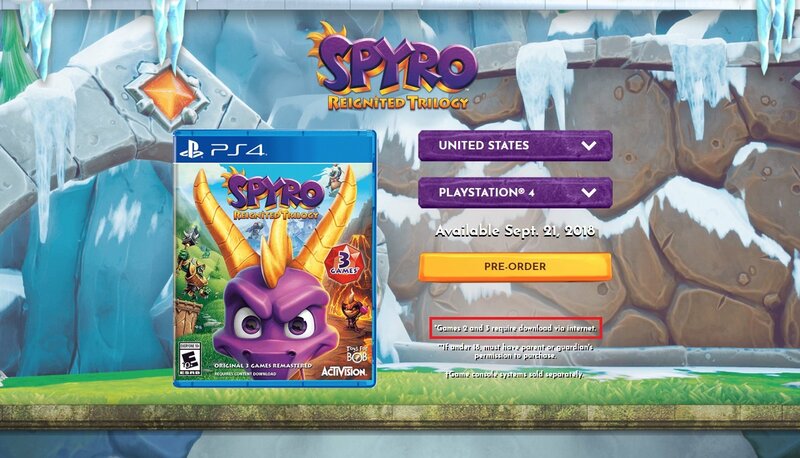 This was noticed by gamers after Activision updated the Spyro website with new box art for the trilogy. Both Xbox One and PS4 box art for Spyro Reignited Trilogy note that “games 2 and 3 require download via internet.” This understandably has fans confused and upset, as many assumed all three games will be included in Spyro Reignited Trilogy as physical discs. Especially considering how the Crash Bandicoot N. Sane Trilogy included all three games on physical disc, before releasing later levels as DLC. Games 2 and 3 in Spyro Reignited Trilogy will come as digital downloads. With so much work, post-launch updates may be required, meaning that the digital download approach makes sense from a development standpoint. Even if it’s not quite what fans were expecting. Spyro Reignited Trilogy is set to release on September 21 for PC, Xbox One, and PlayStation 4. While we wait for additional clarification from Activision, what are your thoughts on the matter? Are you upset that only the first Spyro game will be on disc, or do you not mind that the other two games in the trilogy are being included as digital downloads?